A Heated Bird Bath in Summer? Although this idea sounds totally ridiculous while enduring sweltering heat in summer months, it actually makes perfect sense! So why use a heated bird bath in summer? Because you can always unplug, or deactivate the heater during warmer months. This gives the bath total functionality year round. I never quite understand when I see a bird bath in someone’s yard that has been turned upside down for winter. Do those folks not think birds need fresh water when it’s cold? Absurd! They need it even more, as ponds and other water sources tend to freeze up and disappear. So, if you’re thinking of a new birdbath for your yard, an investment in a heated bird bath is a most practical choice in the long run. Your feathered friends will thank you each and every freezing day! Some bird baths are rendered useless during frigid winter months as they are not equipped with heaters, or are constructed of materials that will not accommodate a heater. This is when birds need fresh water desperately as their natural water sources are scarce. Ponds and even lakes tend to freeze over, and some folks just turn bird baths upside down for winter months. Think about how silly this is…wild birds are dependent on fresh water sources, so why take away their usual water source (your birdbath) just because it’s cold? Heated bird baths are the best choice if you experience severe winter weather. They give you the option of year-round use, by simply unplugging the electrical source in warmer months. 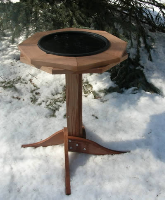 Heated bird baths are available in pedestal, deck-mount, or even ground models as pictured above. This heated bird bath also comes with a dripper attachment to create moving water and attract even more wild birds. 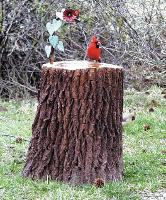 With a one-time investment in a nice pedestal bird bath, you can create a stunning focal point in your garden. This area can be a birder’s paradise with colorful annual and perennial flowers, and evergreens for year-round color. Pavers, flagstone and potted plants can set the scene for a natural and tranquil oasis. Water is excellent for attracting many species of wild birds, even some that don’t frequent bird feeders. Available in a myriad of styles and colors, a bird bath is great choice if you’re looking to create a landscape focal point in your yard. Earthy forms, such as trees and leaves found in nature are used as bird bath designs. These look wonderful in just about any landscape, and if kept filled with fresh water daily–will attract more songbirds to your yard. With the rising costs of bird seed these days, it’s getting more difficult to keep those feeders filled. Water is an excellent wild bird magnet! 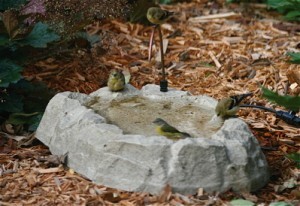 You can attract even a greater variety of wild birds with bird baths, even some that do not frequent bird feeders. 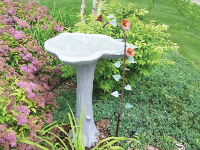 Adding an element of beauty to any landscape, bird baths are available in many styles and colors. Pedestal bird baths come in copper, concrete, and resin to look like stone without the weight. Beautiful ceramic and glass birdbaths come in hanging or staked designs too. If you’d like a more close up viewing experience, deck mount bird baths are a great choice. Water is very inexpensive, and will allow you to still attract and view many feathered friends! 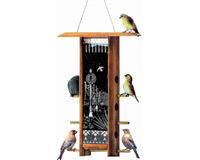 Wild bird feeders are available in a myriad of styles, colors and materials. Today artisans craft bird feeders from copper, hand-thrown pottery, and even stained glass, not mention the old standby-wood. It is believed that wood bird feeders are unhealthy for wild birds as they are porous and can breed bacteria. 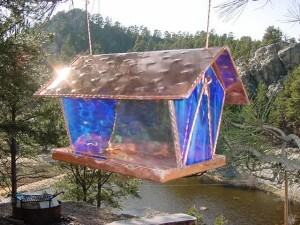 This makes a glass bird feeder an excellent choice that will surely enhance any landscape, and attract wild birds. Glass reflects light, so there’s an added aesthetic of natural beauty. Glass feeders come in several styles, including hoppers, tubes and hanging options. If you’re looking for something unique in the way of feeders, glass is a great choice. Where are All the Other Wild Bird Feeders? Does anyone still feed the birds? 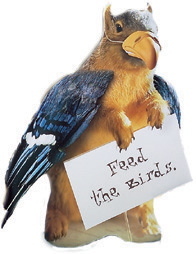 Many folks must have cut back or quit feeding them all together due to the high cost of birdseed and tight finances. I’m curious because it seems that every wild bird within a two-mile radius in my backyard! I am going through many types of bird food at an alarming rate. My thistle feeder, which holds almost 3 lbs. of nyjer, gets filled about 3 times a week. A fly-thru platform feeder gets 3 cups of no waste seed per day. A 7 lb. bag of cardinal mix lasts only about one week. And I have to feed the bluebirds nesting in an older birdhouse good food like meal worms and bluebird crumbles. These birds are eating like horses! This is getting rather expensive, luckily warmer weather is starting, and maybe I’ll be able to cut back some too. At least water is cheap, and the birds love it! Just put up the birdbath heaters from winter, so now it’s time for the bird bath misters and drippers. 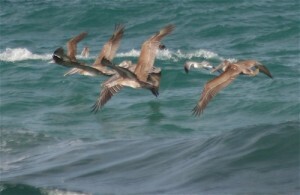 I think my feathered friends have it pretty good around here. As more people seek sustainable products, recycled and “earth friendly” items flood the marketplace. These unique birdhouses are hand made in India, from the fast-growth wood of the Albesia tree. 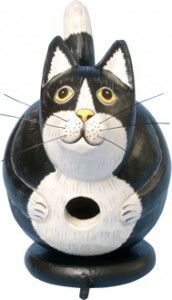 Functional and fun options for you and feathered friends, they provide real homes for wild birds to roost and nest in. Scientific data has shown a severe decrease in available nest sites, mostly the result of urban sprawl and increased competition from non-native species. Cavity dwelling birds are losing nest sites at an alarming rate-real estate is hard to come by for them! By introducing functional, and fun birdhouses, more people might be inclined purchase one, and hopefully will become interested in the stewardship of wild birds by taking up the great hobby of backyard birding. My friend shot this photo in Costa Rica last summer as I had asked for some wild bird photos. The same friend had introduced me to The Surf Rider Organization. At first I thought surfers…what? The Surfrider Foundation is a non-profit environmental organization dedicated to the protection and enjoyment of the world’s oceans, waves and beaches for all people, through conservation, activism, research and education. From their website: “The Surfrider Foundation recognizes that protection of the coastal environment requires protection of an interconnected coastal zone that includes the open ocean, near shore water, beaches, estuaries and coastal watersheds. There is a video on their website that will astound you. It show the massive trash pits on our oceans called jires. There are 5 in the world, having to do with ocean currents, it’s where all of the waste in our oceans accumulate. Most of this waste come from land to begin with. Single-use plastic is a major problem, as it breaks down, but never dissolves. With their many water quality analyses, these plastic particles actually outnumber plankton…pretty scary stuff! The fish ingest it, and guess who eats the fish? I purchased a recycled wild bird feeder a few months back–it came with a lifetime guarantee and looks great. 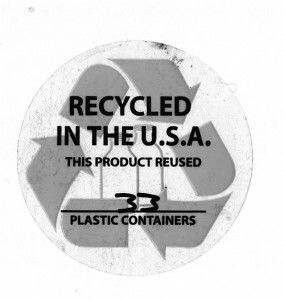 The sticker on the bird feeder was even better saying it reused 33 plastic containers! Just think if everyone would recycle and use recycled products! 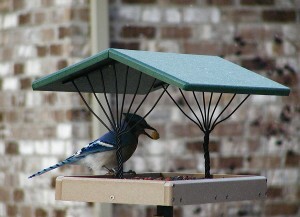 By the way…the bird feeder was manufactured by BackYard Nature Products. Earth Day is April 22, and it’s a great reminder for us all to be more eco-conscious, and environmentally aware of our surroundings and just how we care for this earth. Recycle and reuse has never been a more important issue. For this and future generations, recyclying is paramount. Earth Day shouldn’t be a special day… it should be everyday! These products last a lifetime, and are guaranteed to never crack, split or fade. They keep plastic out of landfills and the ocean, and prevent deforestation. A recycled birdhouse or feeder may cost an extra few dollars, but the investment is well worth it–being the last time you’ll ever have to replace the item. Feeding birds-not squirrels…easier said than done. Most folks who feed wild birds would agree, their gravity defying acrobatics can be infuriating. A squirrel can eat their weight in seed in one week, they can jump up to six feet high and 8 feet across, and they can run 20 mph. A pesky backyard enemy who can destroy the pleasures of wild bird feeding. How can you protect existing bird feeders from squirrels? Baffles and capsaicin are two effective accessories. With hanging squirrel baffles, make sure the baffle is one-third larger in circumference than the feeder. Be sure the bottom of the feeder is at least four and one half feet off the ground, and the feeder is at least eight feet away from trees, shepherds hooks, or any possible launching spots for squirrels. If using a pole mounted, or 4×4 post mount squirrel baffle, make sure the bottom of this baffle is at least four and one half feet off the ground. Make sure the post or pole is at least eight feet away from any sideways launching spot. Also, be sure this feeder is at least ten feet away from taller launching spots, like trees or houses. Capsaicin is effective in deterring squirrels, as they despise the hot sensation that comes from the peppers, but birds do not taste it. Available in commercial mixes, you can easily make your own with cayenne pepper. A few teaspoons mixed lightly with any bird seed …but be careful! It’s painful to breathe the fumes, it burns your eyes, and if it gets on your skin, wash hands immediately. Capsaicin has been scientifically proven safe for wild birds. If your backyard landscaping will not accommodate this type of set up, you may wish to buy a new squirrel proof bird feeder that will win the war for you! There are many models available that work well; Droll Yankee, Duncraft, and Heritage Farms are well known for their high quality squirrel proof products, and even guarantee them. Hanging caged feeders are effective, but you may not really care for a metal or galvanized design in your garden. The new Mandarin squirrel proof bird feeders are attractive in any landscape with their sleek design and large clear view baffle. 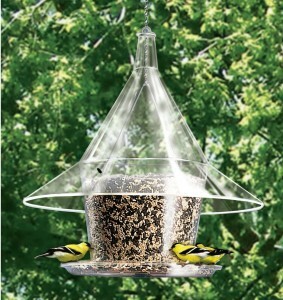 Made from 100% recycled plexiglass, they protect feeders and houses, and also have a lifetime warranty. This model can hang or be pole mounted, and protects seed from rain, snow and squirrels beautifully!